← Fall’s Here! How Do You Like Them Apples? 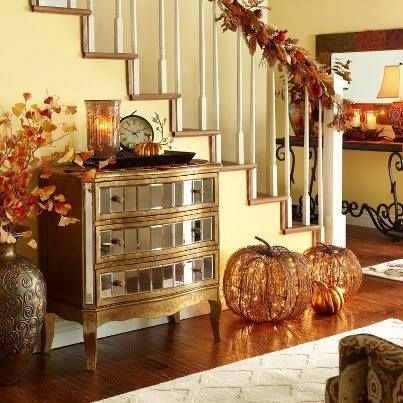 Is your home ready for a warm and welcoming fall update? Here are some of my favorite ideas that are fun and festive. Growing up in sunny South Florida, I never got to experience the changing of the seasons. For the majority of the year, it was sticky, humid heat, with a few short weeks of low-40s temperatures which necessitated nothing more than a light coat. How I longed for what fall is for the rest of the country: vibrant golden leaves, a brisk chill in the air, roaring fireplaces and chili on the stove! Instead, I settled for decorating my house for fall with my mom. If I couldn’t experience the real thing, I could at least feel like I was. Starting when I was around 7 years old, every September we would break out our boxes of wreaths, garlands, and centerpieces. Though we couldn’t collect fallen leaves or pretty twigs from the ground outside to incorporate, we did use our standby plastic and fabric imitations, which did the trick. We even have a miniature decorative autumnal-themed village we set up on our living room table, complete with a ceramic general store, thatch-roofed cottage and little red-topped trees! Even if you’re not the kind of person to go all out, here are some simple ideas that are easy enough to do but have a big, welcoming impact for any visitors your home might have this autumn. Let’s start with the basics. Nothing says “warm and cozy” like soft candlelight. Your options for candles are nearly endless, but there are some classic styles—candlesticks, pillar candles, tealight and votive candles—we think work particularly well for building a fall vibe. A fancy candelabra, complete with candlesticks in shades of burnt orange, pale yellow, and soft cream, makes for an elegant talking point at a dinner party, while a glass pedestal with various-size pillar candles on it also does the trick. 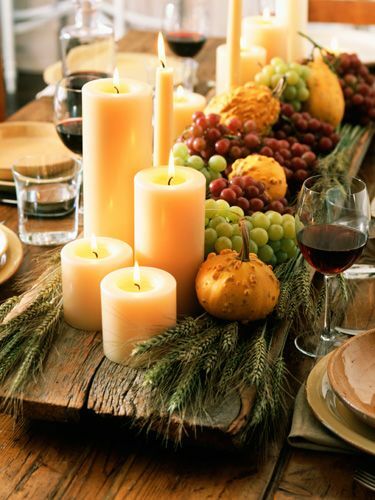 Personally, I’m a fan of placing a mix of these kinds of candles in the center of the table, somewhat willy-nilly, and then arranging mini pumpkins and tealight candles around them. The overall effect is just the right amount of sophisticated and fun. 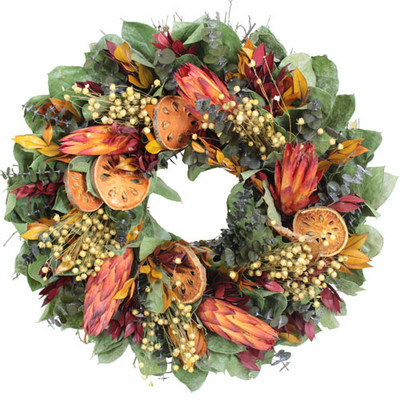 Another simple choice is a decorative, fabulous fall wreath. Whether store-bought or homemade, crafted with burlap or boughs, a wreath on the front door is an excellent way to welcome friends and family to your home. Here’s a great tutorial for 7 DIY fall wreaths. Their suggestions are so creative; one is made from coffee filters, of all things. However, if you’re like me and don’t have the patience for crafting your own, there are great options out there, like the one pictured above. No, not like Judy! 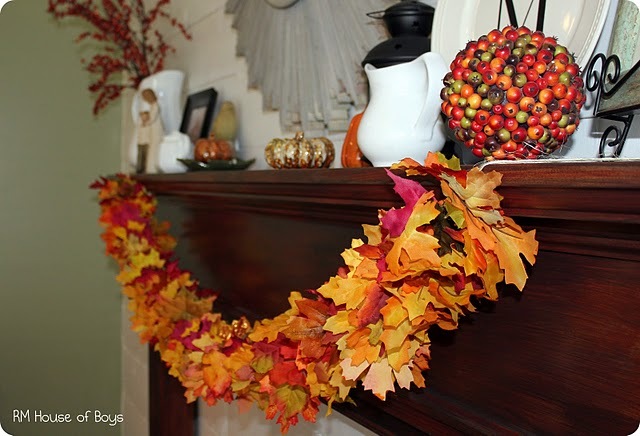 Come fall, I like a good garland decorating my sideboard in my dining room. However, if I had a fireplace that would definitely be my go-to garland placement. Garlands strung around a door frame look beautiful, too. Threaded in between picture frames and votive candles, garlands with gorgeous fall leaves, pine cones and vibrant red berries go a long way in adding fall flair to any setting. One of the great things about garlands is that you can choose one based on your individual style and home décor, thanks to the wide variety available. From loud, full garlands with bright orange leaves and glitter strands throughout to woven burlap garlands with delicate muslin flowers, there’s really something for everyone out there. Pumpkins and Gourds, Of Course! If you have kids, you know there’s nothing they like more than a messy craft when they’re stuck inside on a rainy afternoon! And, really, who doesn’t like playing with glitter once in awhile? With the corn and tomato crops of summer fading out, we have the autumn harvest of pumpkins and gourds to look forward to…and decorate with! These yummy plants can and should be used for more than just spiced lattes and latticed pies. Since they’re so plentiful in fall, you can get them very cheap, making them an easy solution for arts and crafts. All you need for a fun-filled afternoon is some colorful paint, kid-safe glue, glitter and sequins. And don’t forget the googly eyes! No kids in the house? No problem. 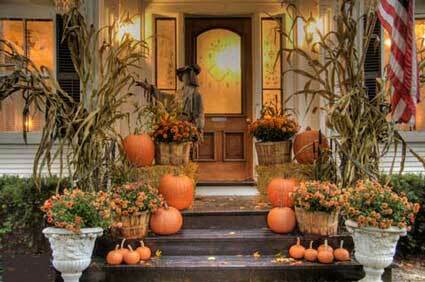 Just arrange the pumpkins in your hearth and on your front porch with an assortment of differently shaped and colored gourds, corn stalks, hay bales or baskets of mums around them to add visual interest. Yet another thrifty solution to fall decorations is glass display cases filled with fall-themed trinkets. 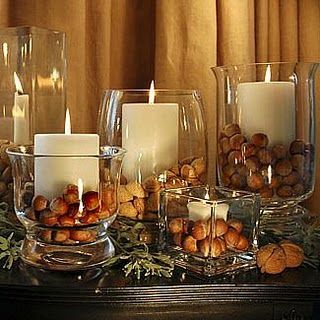 Pick out any old glass vase, and then show off things in it like baubles and beads, acorns you’ve found, and fallen leaves. You can even use a small tree branch from outside (just make sure there aren’t any critters on it). We like this decoration because it’s something you can truly customize. Think outside the box (or vase) and create your own displays with goodies like ripe apples, potpourri with dried pumpkin, or even just cinnamon sticks! 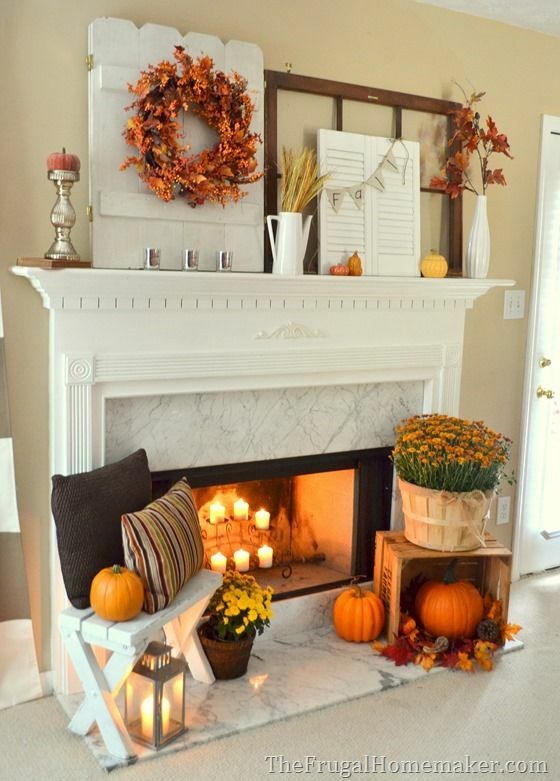 What are some of your favorite fall decoration tips? Katie U, a Smart Perks employee, enjoys hiking, traveling and cheese, but not necessarily in that order. In her off time you can catch her at a brewery, happily playing a board game or begrudgingly watching sports.